The modern movement in furniture design influences my work as a whole. I love the clean lines and use of materials from that era. Lately I find myself giving new life to old materials, a resurrection of sorts, giving new life to an old object or transforming the object into something else, creating a duality in use and purpose. There are two books that have influenced my work greatly and have taught me how to see the extraordinary in the ordinary. They are " The Uncommon Life of Common Objects" Essays on design and the everyday by Akiko Busch and "Odes to Common Things" by Chilean poet Pablo Neruda. If you've given new life to an object or have re-purposed an object send us a picture and a description of it and we'll post it in the viewers gallery. My fascination for the breadbox grew out of my love of modern furniture design. The vintage metal breadbox is a product of post war industrialization. Made out of sheet metal and plywood, a new product that was developed for the war effort, the bread box found it’s way into homes in the mid fifties and sixties. The breadbox is a modern day version of the colonial pie safe with it’s perforated metal back. As a furniture designer I couldn’t design a more functional and utilitarian piece. The breadbox serves its purpose well. The bread box also found its way into American vernacular language as a unit of measure when television personality Steve Allen coined the phrase " Is it bigger than bread box?" on the television show " What’s my line?" 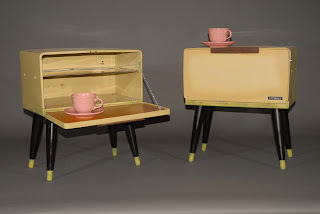 I have taken a collection of vintage Lincoln beauty box bread boxes and turned them into tables. Instead of bedside tables I call these " Bread – side tables". I use legs that I take off of old ottomans from the same era and attached them to the boxes. The tables measure the same height of a contemporary bed, hence the name. I feel a little like Steve Allen did when he gave the breadbox a new use. The closest thing to a genesis event for the cigar box as an invention per se happened between 1863 and 1865. As the Civil War was nearing its end, In 1863 the sale of cigars in boxes and barrels of 1,000 was made illegal. Second-The Federal Revenue Act passed into law that the number of cigars in a box be restricted to 25, 50, 100. 250 and 500. Primarily these two regulations affected the size and shape of the cigar box – important because it somewhat presciently restricted the cigar box to a size suitable for reuse in a stringed instrument. Cigar boxes could not be reused to sell goods again once the tax seal was broken. Since they were made primarily out of wood, they earned a place as fuel for burning to warm the house and heat the stove. A few survived to store scraps of paper or sewing items. In the late 1800’s the cigar box was used as stringed instrument to teach children until they became proficient enough to move to a more advanced instrument. Stringed instruments such as a guitar, banjo, mandolin, ukulele and a violin were all made using cigar boxes. The primary wood used in making a cigar box is mahogany, a perfect wood for instruments because of its acoustic qualities. The advent of big box stores such as Wal-Mart made it feasible for lower income families to afford an instrument. Before stores such as Wal-Mart and Targets lower income and rural families made their own instruments. 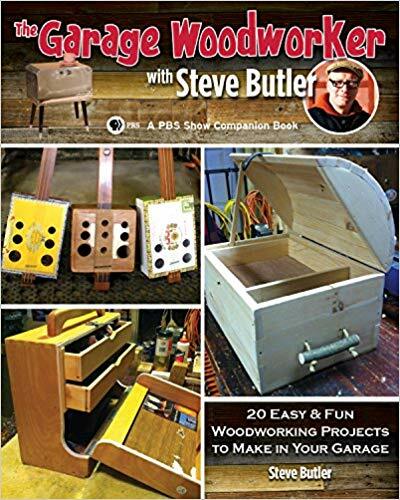 The cigar box guitar found its way out of being a child’s instrument to being a serious instrument used by blues musicians, a favorite instruments to the early delta blues artist because it actually works and sounds well. It’s been nearly Eight years now since I was given a bunch of old pine plank flooring that came out of a house on Cape Cod that was being renovated. I was working at the Worcester Center for Crafts in Worcester Massachusetts when a gentleman came into the wood studio and said he had a bunch of old floorboards that he would like to give away. The boards came out of a Cape Cod house from the 1800’s. They were of random widths and lengths and had nail holes throughout. This was very generous of him but they weren’t really good for much in the way of fine furniture. I thanked him and he told me that he and his family had just recently renovated the house and because of business were now moving to Austin Texas. They loved their old home and were sad to leave it. He wanted to make sure the boards would go to good use and thought someone at the center could use them. He asked if we could send him a picture of the end result. The old boards sat around the wood studio for a couple of years. Once in a while I would haul them out, dust them off and wonder what I would make with them. They were beautiful as objects themselves. They were finished with a varnish on one side that was peeling and was a deep amber color and the other side was a rich grey. The boards were streaked, stained by the old square head nails. I couldn’t imagine running the boards through the planer. I didn’t want to take away the old varnish. I also didn’t think they would survive, they were so old and brittle. A year later I was working in the wood studio with a student of mine. It was an open studio and we were working on our own projects. I noticed David had brought in a bunch of templates. I asked him what he was making and he said he was going to make a pair of Adirondack chairs for a friend. At that moment I realized what I was going to use the boards for. I had always wanted to make a pair of Adirondack chairs myself and these boards of random widths and thickness would be perfect. As a maker we are always trying to create and design something new, meaningful, innovative and note worthy. I have numerous sketches of chair designs in my sketchbook but I can never design a chair that speaks, never mind, screams of a certain purpose and function like that of the Adirondack chair. The sole purpose of this chair by means of its design is to sit back stop what you’re doing and just relax. I made the chairs out of the old pine plank floorboards. The boards with their varying widths and thickness worked well for the chairs. In the end the chairs looked like they came off of a porch from a house from the 1800’s. If it weren’t for the drywall screws I used you would never know. As a designer and maker I feel a little silly submitting images of Adirondack chairs. I should submit something of my own design but these chairs I made out of the old boards hold so much meaning and so much history. These chairs now sit in front of my studio and I often sit in them after a hard day at work. I think how the person who first made them must have felt after he made them, proudly admiring his hand work and sitting in them relaxing after a hard day at work. I often think about the man who through his random act of generosity, and who’s name escapes me now has become part of my family’s history. I wonder how his family is in Austin. These chairs also make me think of the student whose templates I used to make these chairs. I think of my friend Mike in New Jersey who ran into the chairs with a snowplough because I had left them outside all winter. They survived.
. These chairs are all about relaxing, reflecting, conversations between family and friends and creating memories. I grew up in Ontario Canada and spent most of my summers at my friend Dave Bawden’s cottage. I remember sitting on the dock on a pair of chairs very similar to these. Back home in Ontario we call them Muskoga chairs named after a Lake District in Ontario. No matter what you call them or where you are in the world these chairs have become ubiquitous, we hardly notice them, and they are omnipresent. Every store sells a variation of them, of various colours, some in plastic, some in wood. Akiko Busch, author of " The Uncommon Life of Common Objects" published by Metropolis Magazine and D.A.P Inc uses an image of an Adirondack chair on the book cover. I love these chairs. I now carve out my own family history with them. I sit in them with my son and read stories. I sit in them next to my partner Liesl and watch the sun set. I hope one day I can design and build a chair that will have so much meaning. 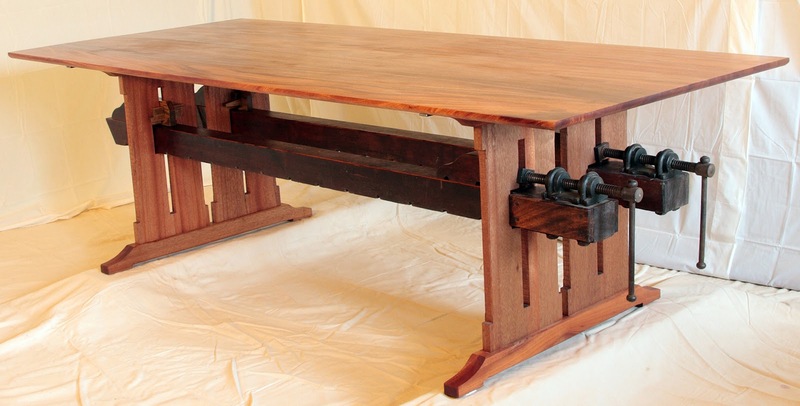 I made this trestle table in 2008 when I was working as the department head of the wood studio at Peters Valley Caft Center in Layton, New Jersey. An associate of the center brought these two antique, eight foot long wooden woodworking clamps to the wood studio and gave them to me. The clamps sat in the studio for a couple of years, they were to heavy to mount on the wall and to cumbersome for any glue up I had to do. I kept wondering what I was going to do with them, they were to beautiful as objects to throw away and after years of good service I felt they deserved to be admired and respected once again. I had an incomplete sketch of a trestle table in my sketchbook. I flipped my book open one day, saw the sketch and new exactly what I was going to do with those clamps. The clamps now serve a purpose once again, albeit a different intention than the original but now they are admired and respected once again. I cut a small portion of the clamps off to fabricate the end pieces, making them look aged to blend in with the original clamps. The clamps work perfectly as the tables' trestle. The table measures 94 " x 41" x 29." 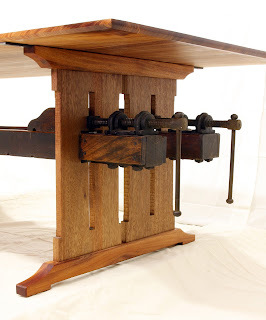 It is made from African Mahogany and the two antique woodworking clamps. 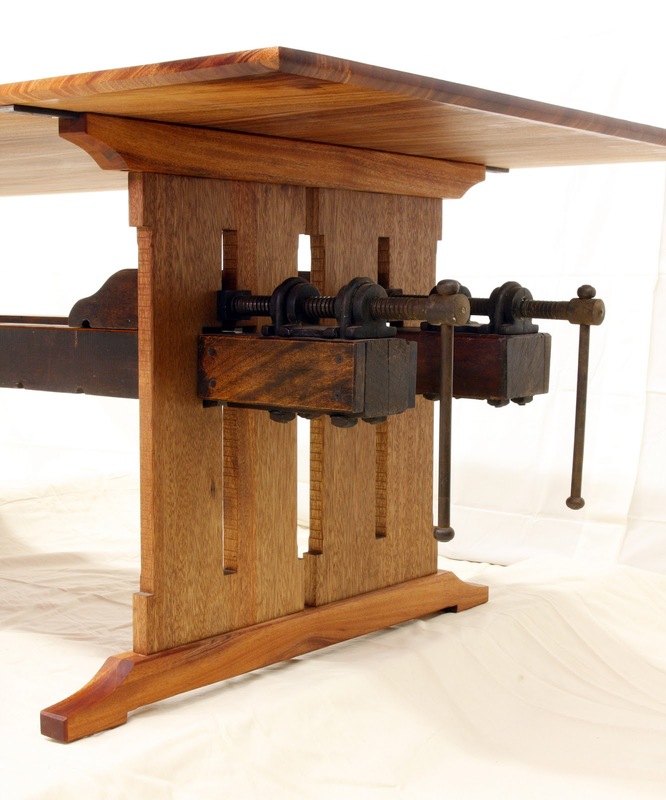 The trestle table dates back to medieval times, when communal dining in a castle's great hall required that the table be taken apart at the end of the meal and stored efficiently so that the hall could be used for other purposes. It consisted of a single plank top resting on two supports that were braced by a single stretcher secured at either end by removable pegs. Probably made out of local timber by the estate's carpenter, trestle tables were left unembellished because cloths covered them at mealtime. The tables were long and narrow because family and guests ( or, in monasteries, monks ) sat on one side while being served from the other. Though few early tables survive ( examples can be seen in book of illuminations), the form has persisted through the centuries, experiencing a vigorous revival in Europe during the 18th Century. The interest in the table is in the wood. The tops of trestle tables are usually made from old growth timber cut into long, thick planks or one single plank with beautiful figuring in the grain, polished again and again and darkened along the edges where hands have touched them for several hundred years. The design of this table is influenced by the medieval tables of the past. The gables ( sides ) are designed to look like church stained glass windows. The connecting stretchers are two large wooden antique woodworking clamps, resurrected from an old barn. 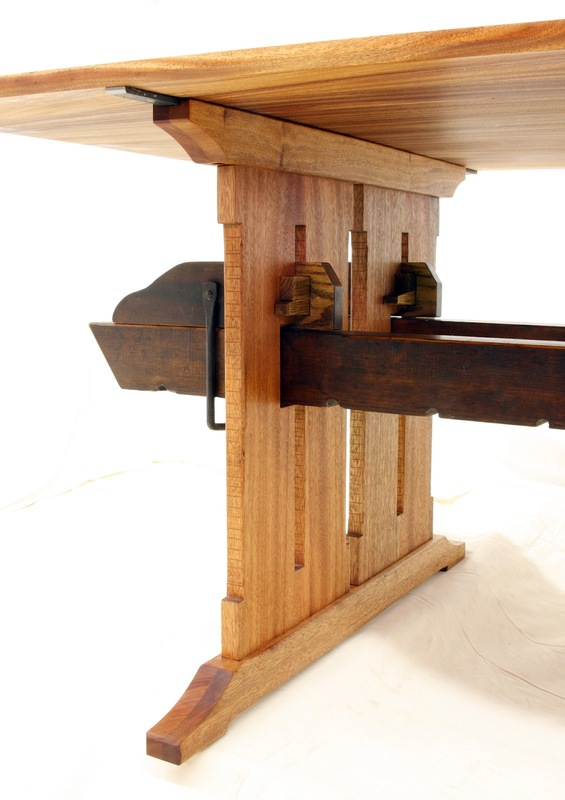 The clamps, initially designed for another purpose, serve as the trestle and literally clamp the table together. The table is made from African Mahogany, a beautiful ribbon striped wood. The table has been finished with wax and oil. Tables, like most household furniture items, have an interesting history from a sociological point of view. The quality of one’s furniture has always indicated socioeconomic status, much like one’s vehicle. A table says something about you. Is the table you sought out sleek and modern? Is it elaborately carved and highly worked, reflecting hours of hand labor? Is it made with a rare, expensive material? Is it made from ecologically sound, sustainable material? Is your table used often? Never? Furniture functions as a narrative of our lives in profound and surprising ways. Chilean poet Pablo Neruda from his book ‘Odes to Common Things’ described tables " As trustworthy: titanic quadrupeds, they sustain our hopes and our daily life." As a maker and designer I’m curious how we assign value to things and how we infuse meaning into inanimate objects. As an artist there is no better object to create than a table. There are no confines, boundaries or borders. It sits freely in a room like a blank canvas waiting for expression. Attention to function is a designer’s first responsibility, and the function of a table is to provide a flat surface for writing, working and eating. There are decisions to make, ergonomics, choice of material, construction methods, joinery and what type of finish is all-important. Lately I find myself giving new life to old materials, a resurrection of sorts, giving new life to an old object and changing the function and purpose of the object from it’s original intent. In this exhibition you’ll find a series of tables created from a variety of objects that started out in life with a different purpose such as flooring from a 19th century home, a bread box, a wine box and a woodworking clamp. The work is about assigning new value and meaning to these objects.